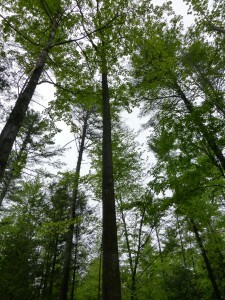 The canopy of the forest – photo is from a May site visit by UVLT staff. 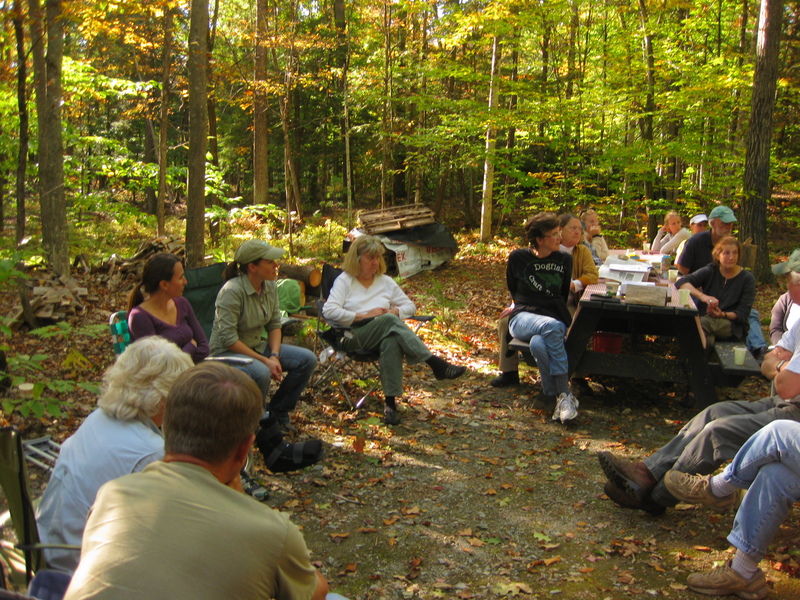 The Upper Valley Land Trust joined friends for a â€œForest Walk & Talkâ€ hosted by the Bradford Conservation Commission (BCC) on a recent sparkling fall afternoon. 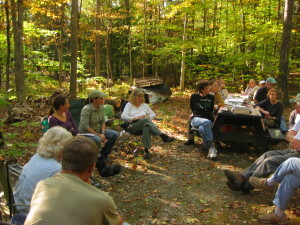 The event drew over thirty people to “Helenâ€™s Haven” to learn about the land, its history, and unique ecological qualities. UVLT and landowner Lora Chatfield are working together to conserve the forest with the support of the BCC. 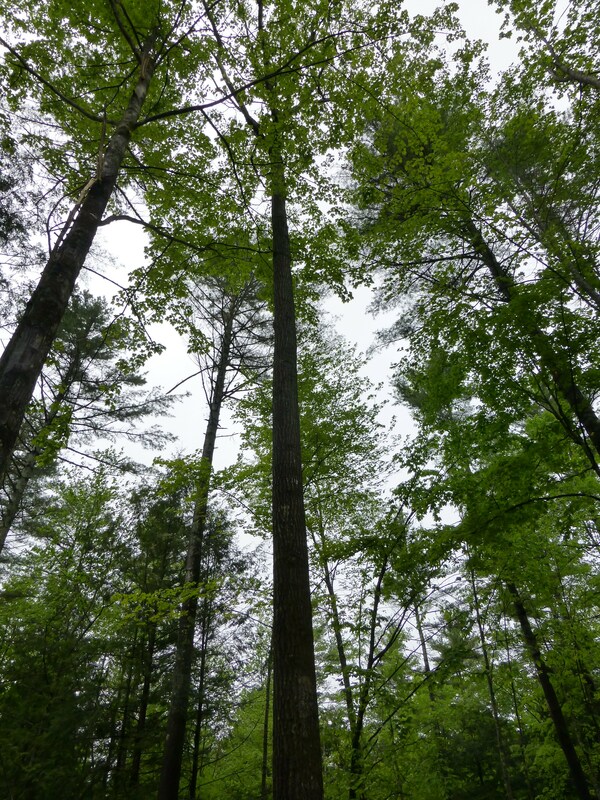 â€˜Helenâ€™s Havenâ€™ is a 76-acre forested tract in Bradford, VT passed down to Lora by her mother Helen Chatfield, one of the founders of the Bradford Conservation Commission. Loraâ€™s gift of a conservation easement to UVLT will protect the forest her mother loved and maintain quality timber production and wildlife habitat to benefit future generations. The gathering provided opportunities for discussion with many local experts familiar with the property and its special features. Consulting forester Markus Bradley spoke about the forest from a timber management perspective, praising the land for its high quality red oak â€“ a relatively rare species to find in high-density stands in Orange County.Â Markus described red oak as a desirable tree in the forest products industry, and also explained its significance for wildlife such as deer, bear and turkey which all feed on acorns. As if on cue, the wide-crowned red oaks surrounding the group offered up many of these nuts with each slight wind gust â€“ the steady shower kept us all alert!Â Redstart Forestry has worked with Lora to develop a forest management plan that enhances the quality timber on the property as well as maintaining important types of wildlife habitat. UVLT’s Amber Boland and Sara Cavin listen to a question about conservation easements. UVLTâ€™s Sara Cavin and Amber Boland described the process of conserving land with a conservation easement to the Upper Valley Land Trust. Sara explained that landowners enter into conservation easements voluntarily and each conservation easement deed is unique to the property it conserves. The terms are crafted by landowners and UVLT together after careful consideration of the natural features to be protected. Â The conservation easement planned for Helenâ€™s Haven will protect land that provides wintering grounds for whitetail deer, hosts a productive vernal pool, buffers town water supplies by absorbing runoff and filtering precipitation through its forest soils, and grows timber for local wood products. The group asked many good questions and thanked Lora for considering the conservation of this special place. Sara also recognized the Bradford Conservation Commission which is assisting with this project. The BCC is dedicating proceeds from its annual Conservation Fund appeal to help cover UVLTâ€™s costs to accept and steward the conservation easement. Neighbor, wildlife columnist, and former Commissioner of the VT Department of Fish & Wildlife Gary Moore gave a historical perspective on the property. Â His family previously owned the land that includes the forests of Helenâ€™s Haven so Gary could recall a time when much of the property was open pasture used for grazing cattle.Â He pointed out some nearby stone walls as evidence of previous pasture boundaries and noted wryly, â€œNo one built stone walls in the woods for aesthetics!â€Â Gary also shared his own wildlife observations on the land, describing sightings of deer, bear (including one very close to home! ), moose, partridge, turkey and snowshoe hare. Lastly, Bradford Conservation Commission Chair and retired biology teacher Nancy Jones introduced the group to some of the smaller and perhaps lesser known residents of Helenâ€™s Haven â€“ those found in and around the forest floor and the propertyâ€™s vernal pool!Â Nancy helped the group get up close to a wood frog, redback salamanders, spotted salamanders, and the pupae of caddis fly larvae, explaining that all were indicators of clean and healthy water. Some of the group then hiked into the property to help Nancy return the inhabitants to the forest floor and vernal pool.Â They then joined those who had remained at Loraâ€™s cabin and all were treated to refreshments and more conversation by a crackling campfire. Like the other participants, UVLT staff enjoyed the opportunity to learn from colleagues and friends, and spend a beautiful fall afternoon outside.Â Many thanks to the Bradford Conservation Commission and Lora Chatfield for hosting this event!Â As the final pieces come together for the conservation of â€˜Helenâ€™s Havenâ€™, UVLT looks forward to celebrating the achievement with the Lora and the local community at the closing.Â Stay tuned for more information, and if youâ€™d like to see more pictures from this event visit the UVLT Facebook page by clicking here. 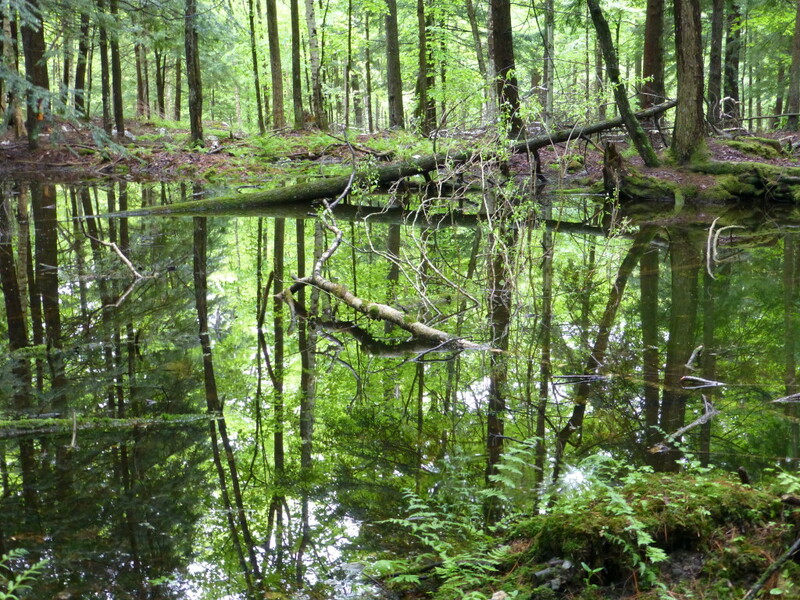 The vernal pool located in the forest of Helen’s Haven. Photo also from the May site visit.